The gorilla facts enables us to understand deeper into the lives of the critically endangered mountain gorillas including how they feed, how they mate & produce, how they adapt, how they socialise, the length of stay among other aspects. Being one of the critically endangered Species in the world as listed on the IUCN red list category, the Mountain gorillas feature a population of about 880 and are known to thrive in Uganda’s Bwindi Impenetrable National Park and the Virunga Volcanoes which is comprised of Uganda’s Mgahinga Gorilla National Park, Congo’s Virunga National Park and Rwanda’s Volcanoes National Park. The Mountain gorillas have low birth rate and are confined in fragile environments which put their survival at stake. Therefore, understanding the specifics about these species is one of the strategies to their conservation and continuity. The surrounding areas are inhabited by one of the greatest populated areas on the African continent who still depend on subsistence agriculture meaning that there is need for land to grow crops which in turn puts the gorilla habitats at stake. The gorilla facts are also useful for the travellers on gorilla safaris in Uganda and Rwanda as they shed light into the human behaviour while with the gorillas and in the gorilla habitats. Mountain gorillas are noted to be social animals that live in cohesive and stable gorilla groups that are kept together by the long term bonds that are between the Adult females and Males. Te relationship of female gorillas is noted to be weak. The Silverbacks are concerned with protecting the members in their respective groups and do not mind about the territories since gorillas are non territorial. Most of the gorilla groups like 61% have one Silverback while 36% have more than one Silverback. The other males tend to form male groups with one mature male and a count of younger males. The members in each gorilla group tend to range from 5 – 30 in numbers with the average count being 10 members. In most times, an established gorilla group has one Silverback which is dominant and then followed by a subordinate Silverback which is most of the time a younger brother, half brother or the first son of the dominant Silverback. 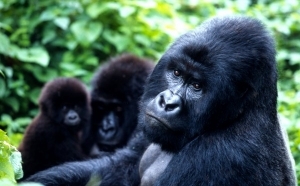 The hierarchy then features one or two black backs, three or four sexually mature females close to the Silverback and a range of 3 – 6 Juveniles and the Infants. Around 60% of the female gorillas and a considerable number of male gorillas leave their respective gorilla groups when they are around 11 years and the separation begins with them feeding at the edge of the group after which they disappear completely. These strayed gorillas can stay alone or in a group for 2 – 5 years before pulling the females to join them resulting into the formation of a new gorilla group. The females tend to leave the natal group at an age of 8 and can join an already existing group or form a new group with a lone male. Females can move on many groups before settling in one. In case of the death or departure of the mother gorilla, the Silverback cares for the baby and shares the nest with the young. This shows that the Mountain gorillas also have alloparental care which is seen in other species like elephants and wolfs. The experienced Silverbacks can remove the poachers snares as well from the hand or foot of the caught member. In Situations of the Silverback’s death, the respective gorilla family faces disruption except when a capable successor has been left behind. The groups can separate and members taken up by another family or in cases of a new Silverback, it can kill the infants left behind by the deceased to create vacuum for the females to conceive his but this has never been observed in stable gorilla groups. Regardless of the strength of Mountain gorillas, they are always shy and gentle. In the group, the aggression is not common except when the subordinate Silverback wants to overthrow the dominant Silverback. 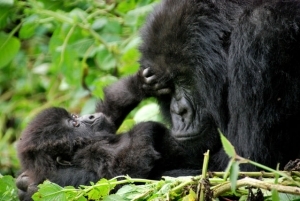 The aggression in Mountain gorillas is always common when a family meets a foreign group. The two Silverbacks can fight till the last effort applying their Sharp canines as the fighting tools which can pose considerable injuries on the rival. The Mountain gorillas utilize the Midday resting session to build and reinforce the group relations. There is un-discriminatory grooming which helps to increase the social coherence in the family. The hair is kept free from Parasites and dust. The young ones are groomed often by the females but the degree of grooming in gorillas is less compared to other Primate species. The young ones engage in a range of activities including wrestling, somersaults and chasing. The adult females and Males can as well engage in the games if stimulated. Mountain gorillas feature 25 Vocalizations which are recognized amongst them. These differing sounds help the gorillas to communicate accordingly especially in the thick jungles where they live and feed from. In order to locate other group members during the move, Sounds of grunts and barks are made. These are also used to call for discipline in the social moments. The screaming or roaring always made by Silverbacks act as warning or alarm calls. The deep rumbling belches are made in times of feeding and resting when the group is content. The Mountain gorillas are known to fear reptiles while the young gorillas are famously known to chase anything that moves past them, they always hold on when it comes to Reptiles and Caterpillars. The reason for this fear is unknown. The Mountain gorillas are also recorded to fear water and can attempt to cross the stream without getting wet like fallen logs. In situations where they have no option, they cross water bodies bipedally. The Mountain gorillas also dislike heavy down pour and would stand still or seek shelter in the nearby cave or tree shade. The Mountain gorillas majorly live on ground and can spend only 5 – 20% of their time in trees which is considerably lesser than the Orangutans that spend close to 100% of their time in trees. The Mountain gorillas would climb to extract fruit or at times to play. They climb quadrupedally most of the times and would rarely jump from one branch to another. The Mountain gorilla Silverback rarely get off the ground because of their gigantic size and can climb to the fruiting trees if the tree can only contain their weight. The young gorillas are the ones that mostly climb trees. The Mountain gorillas start foraging in the early morning at 6am if the weather is good unless when the forecast and considerable coldness, have a rest during the mid morning and Midday and then forage in the afternoon till night time. The half of their day is spent foraging while resting can take 1/3 of their day time. The 6.5% of their time is spent moving from point to point while the 3.6% is spent in the social behavior. The social behavior occurs in the resting period and it is when mating occurs and young gorillas play profoundly. 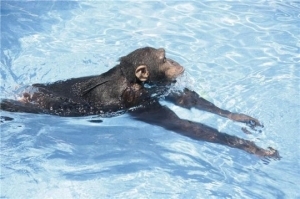 Mountain gorillas are not able to naturally swim in water and as a result avoid large water bodies. But the gorillas like playing with the water and during their foraging encounter; they tend to walk through water bodies like swamps on two (2) legs if the water is reaching their waist. During the heavy down pour, the Mountain gorillas can keep in one point waiting for the rain to end. A cave or a good shelter nearby would be fully utilized to avoid the rain. It can be noted that unlike the Orangutans and the Bonobos, the Mountain gorillas don’t use plant leaves or branches to cover themselves. Mountain Gorillas are noted to be sleeping in the nests built either on ground or trees in relation to the nature of the vegetation around and the security situation. The Mountain gorillas construct new nests every evening as they cannot return to the nest that they slept in last night even if it is very close. Each Mountain gorillas is supposed to put on own nest apart from the infants that share with their mothers. The Mountain gorillas enter their nests about a half an hour to the dark and they hardly put up nests for Midday use. For the ground nest construction, the mountain gorillas pull the plant branches to the center; anchor them on one another to form the layer. Then other plants are pulled to form the nest rim. The tree nests are constructed by putting together forks of branches and related materials which are built to strength so as to manage the weight of gorillas. The young gorillas and females tend to like sleeping in trees compared to the adult males which are disadvantaged by their weight. How much space do gorillas need? The Mountain gorilla families do not require private territories and they never try to defend their territory from other groups but only are concerned the safety of their members. 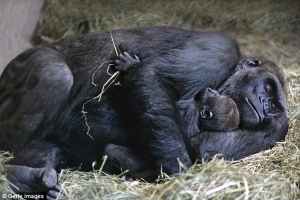 The gorilla families thrive in home ranges whose size is determined by the food availability. The home range is larger in areas where food is scarce or scattered but in areas where there is considerable availability, the home range is always small. The other determinant of the home range size is the gorilla family size. When the group has many members, they would definitely require more space compared to a smaller gorilla group. The size of the home range at times determines the time taken to reach a specific group during the gorilla trekking exercise. The home range features various zones of vegetation which are utilized seasonally. The home range can stretch from 4 – 8km2 and can even extend up to 30km2 if the area has food scarcity. Mountain gorillas are recorded to be thriving in three countries on a world scale namely Uganda, Rwanda and Democratic Republic of Congo. In Uganda, they are found in Bwindi Impenetrable National Park where a minimum of 400 mountain gorillas are known to thrive. Uganda also has another gorilla habitat called Mgahinga Gorilla National Park which is part of the Virunga Mountain block that cuts across the countries of Rwanda and Democratic Republic of Congo. In Rwanda, the Mountain gorillas are known to be living in Volcanoes National Park to the north west of Country which shelters the Rwandan side of the Virunga massif. While in Democratic Republic of Congo, the Mountain Gorillas are found in the Virunga National Park close to the border of Uganda and Rwanda. It is only in these three protected areas that we trace the 880 mountain gorilla population left in the world. The mentioned habitats feature a mountainous terrain in its natural state featuring the verdant flora that mountain gorillas call food. The cool climate in these areas and the abundant moist vegetation has facilitated the survival for these critically endangered species in these areas. Mountain Gorillas are susceptible to disease transmission from Humans and this explains the 7m rule that is supposed to be maintained by the travelers on the gorilla trek. Apart from human diseases, the habitats of Mountain gorillas are marked by wet and cold climate which pushes the gorillas to suffer diseases like the respiratory tract diseases including Pneumonia that can result into death at times. As a result of consuming little fruit and hence less sugar, the Mountain gorillas rarely suffer from teeth cavities compared to their low land counterparts. But the bad tartar in mountain gorillas results into periodontitis which dissolves the jaw bone finally causing teeth loss. 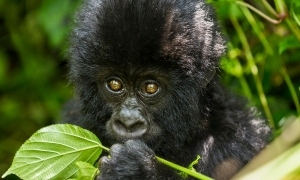 The Mountain gorillas also suffer from Intestinal worms and Malaria though the parasite that causes them malaria is different from that of humans. The poacher snares at times accidentally grab gorillas wounding their feet resulting into severe injuries and death. Ebora is also a big threat to gorillas as it is to humans. The Mountain Gorillas considering their size consume a lot of food. They are noted to consume a range of plants up to 38 species but most especially they prefer eating wild celery, thistles, bamboo, stinging nettles, bedstraw and some fruit. The plants mentioned feature considerable moisture and as a result mountain gorillas do not require water. 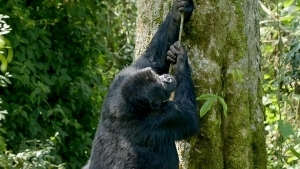 The chewing of plant materials is done by the strong Chewing Muscles that gorilla possesses. The long canines possessed by the adult gorillas are rather used for fighting other than chewing plant materials. The Mountain gorillas are very sensitive to environmental changes and most especially those that occur in their habitats. The issues like logging, cattle grazing; honey collection, poaching, smuggling and mining remain a considerable threat to the mountain gorilla survival. The poachers enter the gorilla forest and set up snares targeting other wildlife like duikers but at the end the snare catches the gorilla hand or foot. The magnitude of the injury sustained can result into the gorilla death. The diseases like Ebola are also a threat to gorilla survival. The Mountain gorillas always explored on gorilla safaris in Uganda and Rwanda features dense and longer fur in contrast to other gorilla species. This is a result of the bid to adapt to the cold mountains cold environment which these mountain gorillas thrive in. The Male Mountain gorillas have an average weight of 195kg and have a height of 150cm on their upright stand. It can be noted that at times Silverbacks can weigh twice the female counterparts. The female gorillas have an average weight of 100kg and can have a height of 130cm. The Mountain gorillas are recorded to be the second largest of all primate animals with the first being the Eastern low land gorillas. The Adult male Mountain gorillas have considerable bony crests which are on top of their skulls giving their heads a conical shape. The crests hold the strong temporalis muscles which are connected to the lower jaw. For Adult females, they have crests but less noticeable. 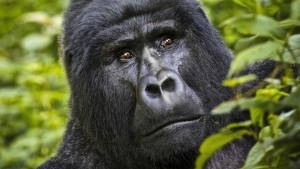 The Mountain gorillas have dark brown eyes with a black ring surrounding the Iris. The Adult male features a silver patch on their back thus forming the foundation for their naming as Silverbacks. The Mountain gorillas are noted to terrestrial and quadrupedal but can as well climb trees to extract so long as the branches bear the capacity to contain their weight. They can also run bipedally up to 6m. The arms are longer than the legs and as a result they do knuckle-walking. Mountain gorillas are diurnal and are always active from 6am and 6pm and utilize this time to forage especially in the morning and afternoon, resting and socializing at midday. In the evening, they put up new nests as they cannot utilize the previous night nests regardless of the distance in between. The infants are spared from making nests and thus share with their mothers. The efforts to save the critically endangered mountain gorillas have done considerable work which has contributed to the mountain gorilla populations in their habitats of Bwindi Impenetrable National Park and Virunga Volcanoes. The mountain gorilla population stands at 880 individuals. The counts of 3 young gorillas thrive at Senkwenkwe Center Orphanage in Congo following the poaching trauma, mother loss and snare injuries. Virunga National Park in the Republic of Congo in Dec 2010 announced on its Official website that Mountain Gorilla Populations had increased by 26.3% for the last 7 years with an estimate growth of 3.7% per annum. The gorilla census which was carried out in the year 2010 as well gave the total population of Mountain gorillas in Virunga massif at 480 rising from the 2003 figure of 380 mountain gorillas, 1989 figure of 320 mountain gorillas and 1981 figure of 254 gorillas. In Bwindi Impenetrable National Park Uganda, the 2011 study indicated a minimum of 400 mountain gorilla population which was a steady increase from the 2006 figure of 340 mountain gorillas and 1997 figure of 320. The method used to ascertain the figure was dung sample collection from gorilla nests. The mountain gorilla habituation has contributed greatly to increase in gorilla populations as the research shows that habituated families have increased in times of size compared to the wild gorillas. With habituation, the gorillas are guarded by the park rangers and have veterinary assistance which is not the case with the wild gorillas. However, despite the positive increase in the mountain gorilla populations, the Sub species are still listed as critically endangered under the IUCN red list category.